"If you want something you've never had, you must be willing to do something you've never done." Samuel Goldwyn has released a trailer for an indie drama titled Tracktown, a sort-of semi-autobiographical story of an Olympic athlete and her trials and tribulations in life and love. That athlete is Alexi Pappas, a Greek-American long distance runner who competed for Greece in the 2016 Summer Olympics in Rio. She stars in, co-writes, and co-directs this film, taking on the full responsibility of bringing her story to the big screen. Also starring Chase Offerle, Rachel Dratch, Andy Buckley, Rebecca Friday, and Sasha Spencer. Her two biggest obstacles: a twisted ankle, a boy she meets that makes he heart beat. This looks charming. Plumb Marigold is a famous but lonely distance runner preparing for the biggest race of her life: The Olympic Trials. But when an injury forces her to take an unexpected day off, Plumb wanders into a bakery where the aimless boy behind the counter catches her eye. In this story that captures the experience of a young Olympic hopeful, many of the actors are actual Olympic athletes -- including co-writer/director and lead actor Alexi Pappas. 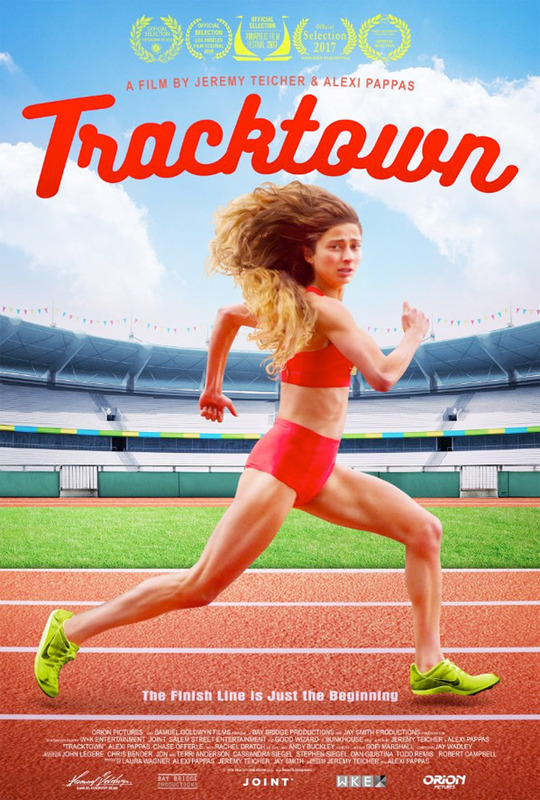 Tracktown is co-directed by partners Alexi Pappas (making her directorial debut) & Jeremy Teicher (director of Tall as the Baobab Tree previously). The two of them also co-wrote the film together. The film first premiered at the Los Angeles Film Festival last summer. Samuel Goldwyn Films will release Tracktown in select theaters starting May 12th coming soon. Anyone interested in this?